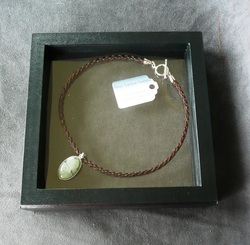 We love to make custom jewelry for people who want to keep a lasting memento of their beloved equine with them always. Browse through our braids and components to chose the elements you like to create a unique piece that reflects you and your horse's personalities. Please be aware that the items in stock and prices can change at any time. We work very hard to find unique and affordable pieces so that everyone can have a piece of jewelry made from their on horse/mule/donkey they can cherish a lifetime. We use only Sterling Silver in our custom bracelets and necklaces. How to order from Tara's Equine Designs. 1. Download and print the Custom Order Form below. Links to photos of the braid styles and charms/beads available are below. 2. Fill out the form completely. Please fill out one form per item you wish to order. 3. Send form, hair and check to the address on the form. Make sure the hair is thoroughly combed through with a human hair comb before mailing your order. It does not need to be washed. A $30.00 comb out fee will be charged if hair is not combed prior to delivery. When we receive the order we will e-mail you and let you know when to expect your completed jewelry. Turnaround time is usually between 2 - 4 weeks. Please allow more time during the Christmas season. Please click the below file to open your custom order form. Please print out a page for each piece you are ordering and send with the hair and check. Choose from a large variety of charms, pendants and beads to make your piece of jewelry extra special. All our custom order components are made from Sterling Silver. Please be aware that quantities are limited and items may go out of stock at any time. New designs will be added as they become available. Choose from 3 different size boxes to display your jewelry when you do not want to wear it.